Beautiful DEANS RAG Mohair Bear. VINTAGE! With Tag! A Must See! She is made from a short pile bristle mohair, and is straw filled. She has little felt paw pads. In excellent, good clean condition, and wearing a pretty little collar of beads and bells. They are plastic (probably safety eyes). Mr McCleod The Fisherman. Mr McCleod will grace any collection. mixes well with others and. 100% Mohair Pile. by Dean's Rag Book Bears. Limited Edition Collector's Teddy Bear No. 39/3000. Limited Edition mohair Eeyore plush stuffed animal. Number 20 of 2,000 in original printed canvas bag I have many Pooh items for sale, please check out my other listings! Rarely seen Dean's 'Robin Hood' bear from 2005. Ve ry g oo dand excellent no n- pl ay ed w it h co nd it io n. Pl us h 10 0% M oh ai r. J oi nt ed b ea ut if ul b ea r re ad y to be displayed in a teddy bear co ll ec ti on. Teddy B (teddy black) wears plaid trousers, rust vest, green bow tie, and beige jacket. His cap matches his trousers. He is numbered #253B. Teddy G (teddy grey) wears blue striped trousers, blue print vest, burgundy bow tie, and dark blue jacket. This is a rare, hard-to-find, Edwardian Bear, #0506, manufactured by Dean's Childsplay Ltd. in Great Britian in the 1980s. It has a brown eyes, a hand embroidered vertically stitched nose, and dark brown paw pads. 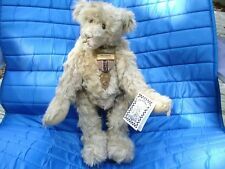 22" Branigan Dean's Rag Book Company Limited Mohair Teddy Bear SUPER NICE! Ending Friday at 20:31 EDT4d 13hTop Rated SellerFrom United StatesBrand: Dean'sSize: 22in. This is a rare, hard-to-find, Porridge Bear manufactured by Dean's Childsplay Ltd. in Great Britian in the 1980s. This bear and its beautiful box were inspired by the 1909 illustration by Jessie Wilcox Smith (1863-1935), entitled "The Epicure" from The Seven Ages of Childhood (as shown on the box cover). WITH STRONG GROWLER! DARK BROWN 17" DEAN'S BRITISH ALPACA WOOL TEDDY BEAR. THIS IS AN HEIRLOOM COLLECTIBLE TEDDY BEAR. He was designed by Dodie Moore of “From the Garden” bears in California. Won’t you add him to your collection of bears. He is a Limited Edition # 221 of 1,000. He is approx. Dean's Rag Book Matilda The Best of Friends Bear. Dean's Rag Book & Compton & Woodhouse. The Best Of Friends Bear. Bear Only Been Displayed. 2000 - White Mohair. Limited Edition 1145 of 2000. Dean's 2000 Embroidered on Left Foot. He is a Limited Edition # 54 of 1,500. He is approx. This is a limited edition, bear number 509 out of only 2,500 made. The original cloth Dean's label is sewn on the the right hand side seam and reads "DEANS CHIDSPLAY TOYS PONTYPOOL GWENT UK". In 1974, a part of the Dean's Rye factory moved to Pontypool in South-Wales and from 1982 till 1986 Dean's used the 'Dean's Childsplay Toys' label. Golden Dawn and Nightfall are a collection of bears. Dean's Rag Book Limited Edition Yellow Mohair Bear 2000. Yellow / Black Mohair Bear. This bear has furry paw pads of black mohair. Golden Dawn. to celebrate the new century and the new millennium from Dean's . Deans Childsplay Mohair Plush Teddy Bear - I've Set My Heart On You, LE, 13"
Around her neck she has a bright red ribbon tied in a bowtie. These lovely Dean's Childsplay Bears are now hard to find. This teddy bear is in excellent condition. Why buy this bear?. DEAN'S "RUMBLY IN MY TUMMY" A LIMITED EDITION WINNIE THE POOH MADE EXCLUSIVELY FOR THEODORE'S BEAR EMPORIUM IN A LIMITED EDITION OF 1000 PIECES WORLDWIDE. IN HIS PAW POOH IS HOLDING A TRADITIONAL HAND TURNED BEACH WOOD HONEY DIPPER WHICH HE SHARES WITH AN INQUISITIVE BUMBLE BEE, COMPLETE WITH A HAND MADE CERAMIC HONEY POT WHICH IS OVERFLOWING WITH A GLAZED HONEY DECORATION. A great asset to any bear collection. Beautiful Collector Bear great condition. Deans Childsplay Mohair Plush Teddy Bear - I've Set My Heart On You, LE, 14"
Lot 4 80's Teddy B & Teddy G Roosevelt Bears Teddy Bears Deans of Britain 17"
Lot of 4 bears in pre-owned condition shipping varies depending on location. Mohair fur, black plastic eyes and a black stitched nose and mouth. Collector's bear made by Dean's Rag Book Co. LTD. Dean's label sewn on one foot. Ribbon label has limited edition #1308 and details at side seam. This is Dean's Chinese Gooseberry designed for Deans by Faith Jenkins. He is a limited edition of 500 pieces and he is No. 384. Also never handled as he has lived in his box with his certificate and put away in a sealed container since his arrival years ago. This charming bear is number 70 of 500 pieces and it is part of their birthstone series. This little guy is 11" tall and is 8" when seated. This is a fully jointed mohair bear with shoe button eyes, velvet foot pads and a sewn nose. 1964 PIT "The World's Liveliest Trading Game" by Parker Brothers. Original box is untorn with original price tag. Complete set of commodity cards plus a bull and bear card and complete instructions. Like its never been played. I day trade part time so I love this game! New Flat Rate Shipping coming for All board games. Combined Shipping Always. Looks unplayed with. Has plastic nose and designed without seperate pads. Fully articulated. Made in England. Smoke and pet free. Gold mohair plush, no wear, no fading. Fully jointed. Dean's Rag Book Co Ltd was founded in London England in 1903 by Henry Samuel Dean. Dean's began production for the collectors market in 1991 using old patterns and the new resurrected Rag Book fighting dogs logo on their labels. Deans UK Howard Bear Collectors Club Exclusive. Dean's Collectors Club 1615. Limited Edition Bear. 1998 Production only. Kept Storaged. Excellent Condition. 20 cm / 7.9 " sitting. Original side seam label, Dean's Pontypool Gwent England. Dean's Rag Book Co Ltd was founded in London England in 1903 by Henry Samuel Dean. Dean's began production for the collectors market in 1991 using old patterns and the new resurrected Rag Book fighting dogs logo on their labels. HRH Golden Jubilee Mohair Bear. HRH Golden Jubilee Embroidered On Left Pad. Which Has Been Produced In Pure Mohair. " Majesty ". Dean's Rag Book Co. Limited Edition. Dean's Rag Book Co. Dean's Rag Book Label On Right Pad. Toby The Best Of Friends Bear. 100% Mohair. Dean's Rag Book TobyThe Best of Friends Bear. Dean's Rag Book & Compton & Woodhouse. With Large Suede Paw Pads. Bear Only Been Displayed. Limited Edition 1145 of 2000. Made from soft blonde mohair plush, dark grey eyes, dark brown vertically stitched nose. Fully Jointed. He wears his original red neck ribbon printed in black Norman Rockwell. Dean's Rag Book Co Ltd was founded in London England in 1903 by Henry Samuel Dean. Dean's Rag Book Hardy the Mohair Bear. Dean's Rag Book. Blue Satin Bow. With Large Suede Paw Pads. Bear Only Has Been Displayed. Limited Edition. Limited Edition 4355. THIS SWEET TEDDY BEARS BEAUTIFUL MOHAIR IS IN GOOD CONDITION.JUST A GREAT FACE!FUN TO POSE AND NICE SIZE FOR DISPLAY. HARD ONE TO FIND! THIS SWEET TEDDY BEAR HAS VERY PRETTY, VERY THICK NICE MOHAIR, NICE TO TOUCH AND HUG! Mohair Bear. Which Has Been Produced In Pure Mohair. Dean's Rag Book Co. Dean's Rag Book Label On Right Pad. Limited Edition 2005. A Special Edition For The Dean's Collectors Club. With Hand Embroidered Features. She is a Limited Edition # 75 of 500. She is approx. He is a black mohair bear, and he is #206 of 3000 and has his certificate. He is a 9" bear. THE HEN NEST HAS LONG BEEN KNOWN FOR ITS SELECTION OF WONDERFUL ARTIST BEARS AS WELL AS THE TOP MANUFACTURED ONES. Limited Edition Centenary Year 1903 2003. 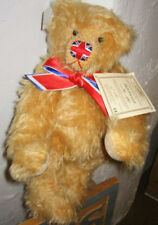 A Limited Edition Centenary Bear 1903-2003. Dean's Rag Book Co. Apple Blossom Bear. Dean's Rag Book Label On Right Pad. This Beautiful Bear Is Issued In A Limited Edition Of. Wonderful Dean's Rag book with images by Josephine Wilkinson. Spine is difficult to read but look s like it is number 7286/6800 and also says "A Dean's Barn Safe Book" on the front cover. New old stock, never opened or washed. Clearly identified on "spine". Made in England. This is a great 15” bear from 1970’/80’ s by Dean's Gwentoy company in England. Fully Jointed Golden Brown With a Rattle inside . He is in great condition and being sold as is . Please check out all photos and ask questions. Dean's Rag Book Co Ltd was founded in London England in 1903 by Henry Samuel Dean. Dean's began production for the collectors market in 1991 using old patterns and the new resurrected Rag Book fighting dogs logo on their labels. Fabulous Deans bear made of pure British Wool, he is No. 449 in the Inaugural Edition of the Schoonmaker Signature Series. They are limited edition reproductions of antique bears from the personal collection of noted teddy bear authority and author Patricia Schoonmaker and manufactured under the personal supervision of Mrs. Schoonmaker. Beautiful Collector Bear in great condition! Deans Childsplay Toys Stuffed Animal Bear 80th Anniversay # 435/2500 UK 1983 14"
It is a 80th Anniversary bear. This bear is numbered 435 of 2500 and was a Limited Edition. He is a jointed bear and was made in the UK. HE IS NUMBER 317. HE IS FULLY JOINTED. HE HAS HIS ORIGINAL RED RIBBON AROUND HIS NECK WITH AN ELEPHANT ON ONE END AND NORMAN ROCKWELL ON THE OTHER END. HE IS IN VERY GOOD CONDITION, JUST A LITTLE DUSTING FROM LAYING IN A BOX TOO LONG AND BACK SIDE FUR NEEDS TO BE FLUFFED UP.